You may have extended car warranty for things you cannot fix yourself, however you can still avoid an expensive trip to the garage by learning how you can fix four common car problems at home with our expert guide to fixable automotive issues. Are your car’s warning lights flashing on and off? Are you wondering ‘how am I going to ‘fix my car?’ While most car repairs can seem overly complicated and difficult, it’s surprisingly easy to take care of small repairs and routine maintenance without taking your car into the garage. From changing your car’s air filter to checking your battery terminals, read on to learn how you can fix four common car problems at home and save hundreds of pounds in garage bills. Oil is to your car what blood is to your body – it’s vital for everything, from engine components to gear transmissions – to function properly. You should change your car’s engine oil every 3,000 miles, or sooner if you drive a high-performance car. Changing your car’s oil might look difficult, but it’s surprisingly simple. By doing it yourself at home, you can reduce the cost of having it serviced at a local dealership or garage to around £15 in spare parts. Start by warming up your car. This helps you remove all the oil from the engine. Let it run for a few minutes to warm the engine up but make sure it doesn’t get too hot – if the oil is hot when you drain it, you could burn yourself. Elevate your car using a jack or ramp and locate the drain plug. Put your pan under the plug and use your socket wrench to unscrew the plug and drain the oil from the engine. Replace the oil drain plug or refit your old one. Find the oil filter and open it using an oil filter wrench. Remove the old oil filter and the rubber gasket that’s attached, being careful not to spill old oil over the ground. Use a small amount of oil to lubricate the gasket on your new oil filter and fill it 2/3 full with new engine oil. Gently screw it into place and double-check that it’s firmly installed before opening your car’s bonnet. Open your car’s bonnet and remove the oil cap. Fill the engine with your new engine oil, making sure you stop when the dipstick indicates it’s full. Screw the oil cap back into place and clean up your work area. Many electrical warnings are due to your car’s battery not being properly connected or maintained. Checking your battery terminals takes less than 15 minutes and can be done with nothing more than a wire brush and corrosion removal fluid. Start by carefully removing the cables from your battery. Remove the negative cable first (it will be black and marked with a – sign) and the positive cable second. Brush the battery posts lightly with corrosion removal fluid to remove battery acid rust. Use your wire brush to clean the battery terminals, then wash away the corrosion removal fluid with water. Dry the battery before reattaching the battery terminals, starting with the positive (red, marked with a + sign) cable. Take care not to overtighten when reattaching the cables. Once you’ve cleaned the battery terminals, restart your car and check if any of the warning lights are still showing. 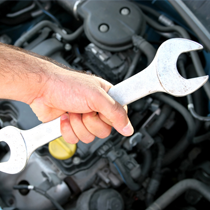 If warning lights still show, take your car to a local garage or the dealership to diagnose and fix the problem. If you want your car to run at its very best, it’s important to change its air filter on a frequent basis. Your engine needs clean air to function properly, and a dirty air filter can cause dirt and durst to enter the engine and cause serious reliability problems. Changing your car’s air filter takes around 10 minutes. You don’t need any tools or accessories aside from a new air filter. Check your car’s manual to make sure you buy the right type of air filter for your vehicle. Open your car’s bonnet and find the air filter. Use the metal clips on either side of the filter’s case to pop it open and remove the old filter from the box. Put the new filter in place before closing the filter case and securing the new filter in place. While replacing an air filter it quick and simple, it’s not completely risk-free. Make sure you don’t drop anything into the filter housing, as it can enter the engine and damage the car if it isn’t spotted and removed. The more it rains, the more wear your windscreen wipers are subject to. In sunny places like California this isn’t such an issue, but in Britain it’s best to replace your windscreen wipers every six months to optimise your driving visibility. Not sure if your windscreen wiper blades need replacing? If you notice streaks of water on your windscreen when it rains, your blades aren’t smooth and should be replaced as soon as possible. Replacing your windscreen wiper blades is quick and simple. Start by pulling out your windscreen wiper from the windscreen. Press the tab on the rear side of the wiper and remove the wiper blade from its housing. Carefully line up the new wiper blade with the mechanical arm and move it into place. Pull on the blade so that it clicks securely into the wiper arm and lower the arm onto the windshield. Pull the other windscreen wiper out and repeat. Finally, consider buying an extended car warranty to protect yourself against the things you can’t fix yourself. The peace of mind of an extended warranty can make owning your dream car a more comfortable experience. Contact us on 0800 001 4990 today for a quote, or enter your registration in the box above.